When I started at Master of Arts in Urban Affairs program at the University of San Francisco I just knew that I was interested in understanding the opportunities to mitigate climate change through urban transportation policies and planning. To be working for the state of California as a transportation planner at Caltrans just two years later as an alumna of the Urban Affairs program is still a little crazy to me; but also very exciting. 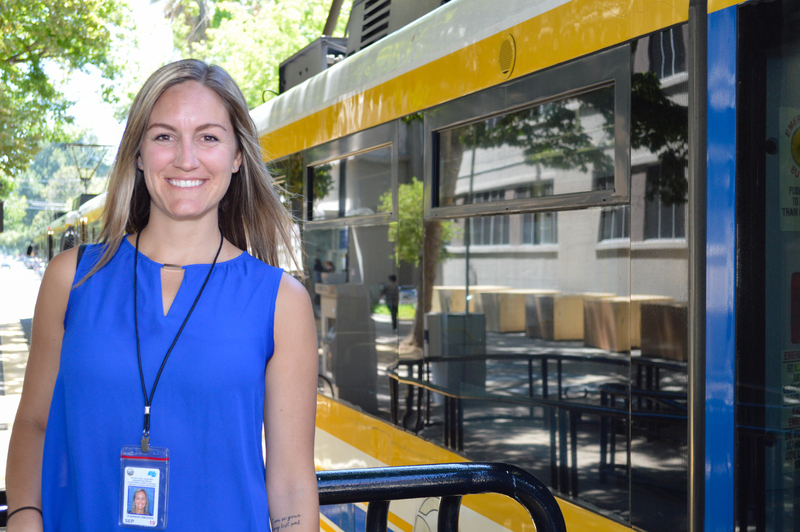 As a graduate student, I tailored my classes and research to focus on different aspects of transportation as it relates to the environment and urban spaces—and it worked! I get to work in the field I studied and get to learn something new every day. I currently work on the Rail Planning team developing the 2018 State Rail Plan. I am working to coordinate commuter, regional and intercity trains with freight and local bus routes to create a truly integrated, state-wide system. I like that I get to learn about a new area of transportation for me—rail while bringing in a new perspective that tries to incorporate climate sensitivities and equity into the rail planning processes. It is exciting to be coming to Caltrans right now because there is an organizational shift to promote more rail and mass transportation to reduce congestion and environmental burdens. My background in community organizing has landed me in the public engagement role, so I get to meet with various rail stakeholders across the state to discuss and plan the best ways to integrate a system as massive as California’s rail. I am in the midst of analyzing draft reports and coordinating feedback from transit agencies—skills I honed at USF through analytical research as well as through group work that taught me how to engage multiple perspectives and synthesize differing ideas. In many ways, I am still learning so much it feels like an extension of grad school. But now, instead of turning in my notes and drafts in to a professor, I am providing support and feedback for key transportation planners and advocates at Caltrans and across the state. I can’t say enough about how happy (and still a little surprised) I am to be directly using my degree right after graduation to work to promote more sustainable transportation modes across the state! Applications are still being accepted for fall 2016 – apply for the Master of Arts in Urban Affairs program today! Contact Angela Fleekop at amfleekop@usfca.edu with questions. Read more about our Master of Arts in Urban Affairs students and alumni! This entry was posted in Master of Arts in Urban Affairs, Uncategorized and tagged Alumni, Bay Area, California, California State jobs, Caltrans, climate change, community organizing, environmental justice, gradstudent, higher education, Leo T. McCarthy Center, McCarthy Center, public transportation, rail planning, Sacramento, San Francisco, Summer 2016, transportation, University of San Francisco, Urban Affairs. Bookmark the permalink.